Several fellow students have asked me for advice on how to go backpacking or camping economically. I even got an email from some high school students that have heard of GUCK (my university's camping club that I founded/co-organize), and they asked me about this as well. In short, it can be cheaper to buy a decent set of backpacking gear than it is for your average student pub crawl on a typical Friday night, as you will soon see. This will be a guide to putting together a cheap and effective set of backpacking gear. When you compare backpacking--even if you include band new, high-tech, ultra-light gear--to other outdoor activities (e.g. canoeing/kayaking, skiing/snowboarding, fly fishing, mountain climbing, etc. ), it can be a relatively inexpensive hobby. Once you get a solid set of gear, you don't have to buy anything else unless you need to replace something if it breaks or gets damaged, it should also be noted. There are no memberships or dues to pay, and you can do it all on your own. So let's get started: the big three. The big three in backpacking are the backpack, sleep system, and shelter. I would say that the backpack and shelter are the easiest of the two to take care of, as well as the cheapest. If there is any part of your gear that you should also spend a little extra money on, I would definitely say it's your sleep system. But first let's knock out the two easy fixes. One I have already written about in another post last year, so just check that out. The short of it is that you can make a decent, wind and waterproof shelter out of cheap plastic sheeting and/or garbage bags. Perhaps the cheapest and easiest solution you will find for any backpacking gear. Now on to backpacks, a slightly more complicated gear choice. Before anything, make sure to do your homework on what kind of backpack would be best for you. How much volume, how much does it weigh, how much weight can it comfortably carry should all be taken into account before your quest begins. For three season use, I happen to prefer backpacks that are around 40-50 liters of volume, are less than 1kg in weight, and can hold up to 10-15kg without issue. In the summertime, however, I tend to take less weight and bulk, so a pack that is 20-30 liters, less than 500g, and can hold up to 8-9kg works great for me. 1. Buy El Cheapo made-in-China special at your local department store (e.g. Walmart and K-mart in the USA, Jula and Clas Ohlsson here in Sweden). 2. Buy a decent pack used, best bet being online (ebay, blocket, etc. ), but if you are lucky and/or look hard, you can find one at 2nd hand stores or yard sales too. 3. Make your own backpack, DIY baby! Choice 1 is a gamble. I have bought several of these kinds of bags in the past for very cheap, and some of them I had for years with little or no issues. I have one that I use as my urban backpack (books, groceries, etc.) quite regularly that I have had for about 7 or 8 years and it is still going strong. I paid 25 USD for it at an army base. Then again, I bought my wife a different one several years ago here in Sweden and it broke down after about a year of occasional use, and only 3 or 4 normal backpacking trips. Choice 2 is a safe bet, but takes more time and research. It's best to read reviews, ask the seller questions (how many nights out has it been used total, for example), and shop around. I recently, through a backpacking website's forum, got a pack that new would have cost me about 235 USD with shipping, for 135 USD with shipping. There are good deals out there if you are patient or lucky. Choice 3 is also a safe bet, but you have to work, of course. It also calls for either you or someone that can help you to know how to use a sewing machine. 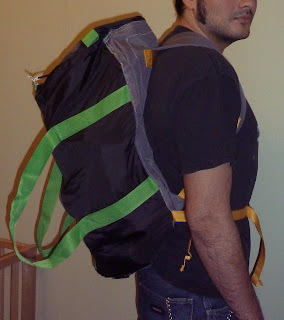 Last year I wanted an ultra-light backpack but lacked the funds, so I made my own with a simple idea in mind. I bought a cheap Duffel bag from IKEA, cut a back of a ski bag off that I got as a gift (I don't ski, so not sure why this family member thought this was a good gift, but turned out to be put to good use), and then had my wife sew the two together for a surprisingly decent bag. I would take my DIY bag below over plenty of fancy, expensive packs you find at specialty camping stores, and have taken it out on plenty of trips into the woods. Wearing it for the first time, it has since been modified for some slight improvements. Note the basic hip straps. Inside loaded with gear, easy to access opening, and the total weight of the bag is only 450g. Almost done with the big three! Now it's the sleeping system to take care of, perhaps the single most complicated and diverse gear choices in backpacking. If you don't know the basics, I wrote a good deal on it in another post. 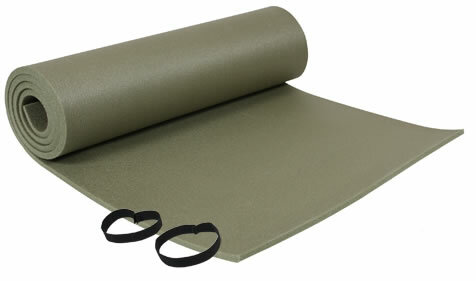 Let's first cover sleeping mats, which should be the cheaper and easier part of the system to cover. For the broke backpacker, you are pretty much limited to foam pads and bulkier, heavier versions of both self-inflating and inflatable mats. In warmer temperatures, and when most broke backpackers like students go camping i.e. summer time, all you need is a foam pad. A lot of really good things can be said about foam pads, though, so don't worry. They are lightweight, provide not-bad insulation and comfort, and are tough and can't deflate even if they do get damaged. You can also use it in combination with another sleeping mat for more insulation when it is really cold out. But if it is cooler out, or if you find foam pads uncomfortable, you are going to want something with air in it, which makes it both warmer (higher R value) and softer. Here in Sweden I have seen generic self-inflating sleep mats for as low as 200 SEK (28 USD), which is not so bad. There is also the option of buying used, but make sure to be careful on this one! You don't want to buy a defective, leaky mat and then not be able to get your money back. A defective backpack you can spot easier, and fix easier as well, by contrast. Next is often the wallet breaker in the world of backpacking: a good sleeping bag. Again, if you don't know much about them, read the article I wrote that is linked above before you even think about buying anything. Down feather sleeping bags are going to be more expensive, so unless you buy used, the broke backpacker is stuck with synthetic sleeping bags. This ain't so bad, nor should it prevent you from getting out there and camping. But synthetic bags are nearly always heavier and bulkier. They can be pretty cheap, at least, and I have seen sales here in Sweden for bags as low as 100 SEK (14 USD). After you buy a sleeping bag, it's a good idea (especially if it's of questionable quality) to test it out before you go out and adventure with it. Ratings are hard to measure, and are often even harder to measure with mass-produced generic products from companies that just want you to buy it, so they will bump the temperature ratings up to make it seem like a better deal than it really might be. If you test your bag outside (like in your backyard) and you are even slightly cold with it, it's probably going to be worse out in the woods. Either get a better bag or take extra layers like a thick wool sweater and/or socks to make up for it. So there! The big three is out of the way. If done right, here in Sweden you really could take care of the big three with as little as say 550 SEK (78 USD) total; with 250 spent on backpack (or materials to make one), 250 spent on a synthetic bag on sale plus a foam pad, and 50 on a roll of duct tape, garbage bags, and some rope for your DIY shelter. This covers many first aid and safety concerns, is only about 100g, and cost little. Cooking, many people forgot, is actually optional. You don't have to take a stove or pots, and just eat non-cook foods or foods you can grill over a campfire with sticks. If you want or need (if it is raining or no wood around for a fire) a stove, then get a cheap pot/tea kettle (camping store has cheap little aluminum ones, or 2nd hand store), and then make your own stove out of a can of cat food. Below is a picture of my cat food can stove, windscreen, and small tin pan (heat reflector/ground protector/primer). It only weighs about 30g total for all three parts, and works pretty damn good. Here is a video how to make the stove, and here is one on how to make a wind screen for your stove. A good knife I would highly recommend, though there are some ultra-light zealots that insist that a razor blade is all you need. A Mora knife is very cheap and of surprisingly good quality for the price, about 30-200 SEK depending on the model. A compass can be easily found for 50-100 SEK at camping stores, or for free on your fancy telephone if you have one (don't run out of batteries and get lost, though). Maps can be downloaded from the internet for free and printed for cheap most of the time. To waterproof a map, just buy a roll of clear tape and tape it up. Rain gear is also easy to find and cheap. A rain poncho can also double as your backpack rain cover by wearing it over both you and your pack. You never have to buy a water bottle. Take some plastic bottles out of your recycling bin, clean them out, and there you go. 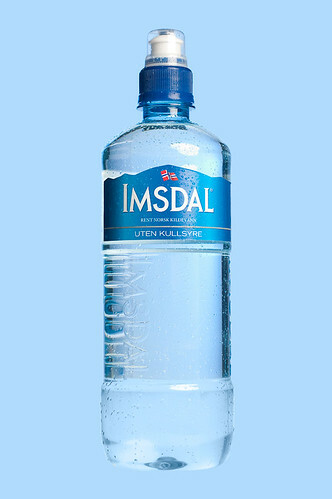 My current favorite are Imsdal bottles, which cost 15 SEK (plus you get nice Norwegian spring water) for 700ml and only 30g in weight. Most of all with the rest of the details and filling gaps in your gear, it is best to just get out there and learn by doing. If you go on your own, take notes while you are out there on what could be brought with you next time or how to change things or a good improvisation you came up with. If you go with others, ask lots of questions about how they do things, you will be surprised what you will find out about how other people do things while backpacking. So go out and get yourself a set of good, cheap gear, try it out, have fun, and in the mean time you can always save up money for nicer replacement gear and/or backpacking luxuries. In the future I will go over my current ultra-light set up. It wasn't cheap, though it was not that expensive either, when considering other interests--like say high end fashion and stylish, band name clothing, of which I own none (I am a cheap jeans and t-shirt kind of guy). But backpacking and camping is what I am passionate about. It's my thing, and I love it and take it seriously. So once you get out there and put in night after night out in the woods, every season, maybe even every month of the year, then things start getting serious and you want serious gear to deal with it better, faster, lighter, stronger, etc. So for the more devoted backpacker, or to see what a devoted backpacker's gear looks like, you can read a complete breakdown of what are my current "best" gear solutions I could put together for my wants and needs.